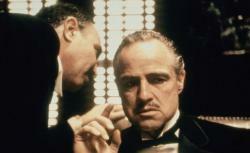 This week marks the 40th anniversary of The Godfather, one of the finest films ever to grace the silver screen. To celebrate its birthday, we’re inaugurating a new Brow Beat feature, in which we pay homage to landmark films by encapsulating them in three animated GIFs. In the comments, let us know which three GIFs you would have selected, and nominate the motion picture we should take on next. Images from The Godfather © Paramount Pictures 1972.